Cockrobbinn has been chuffed all day because he received two unexpected gifts from his grand-kids this morning; an insulated coffee mug and a fridge magnet. I ought to add that he also received some other lovely birthday presents as well. The reason I am smiling at this is because Cockrobbinn retired nearly three years ago and after two/three months found he was actually a bit bored having worked long hours all his life and no hobbies to speak of. He was then persuaded to return to his business on a part-time basis two or three days a week but much more locally (he had been commuting into London for many years and also travelling a great deal). He decided he would do this part-time work for about a year or so and then completely retire. For the past twelve months I have been trying to persuade Cockrobbinn to completely retire as we spend a lot of our summers on the Isle of Wight and although he would come over for a four-day weekend, I thought it was time he finished completely with work as he can get very involved with it. His reply has always been that he needed a hobby or something to occupy his time and very little really interested him. He tried to learn to cook once and although I never actually got food-poisoning, we both came to the same conclusion that cooking was really not his forte! He hates gardening although he will mow the lawns once a week; he’s dangerous with a paint-brush and thinks a quick coat of topcoat will cover anything, and any DIY tool in his hands becomes a lethal weapon. Late last August we discovered Geocaching and I have a wonderful feeling that this is what Cockrobbinn has been looking for. 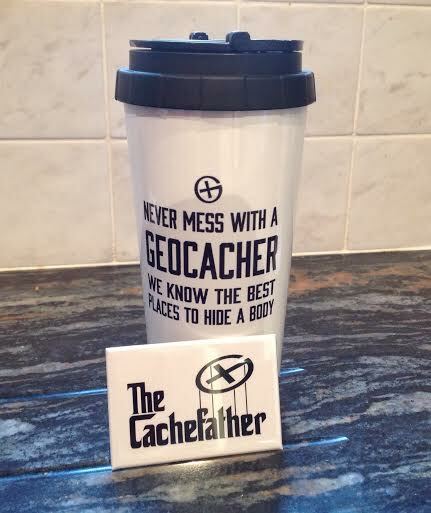 Do you need any other hobby than Geocaching !!!!! This entry was posted in Geocaching, Hobby and tagged Geocaching, Hobby, Retiring. Bookmark the permalink. Happy birthday, Cockrobbin! Those are pretty cool gifts. I especially like the magnet!